You will first need to create an action box that we will use for the popup. If you haven’t done so, check out our guide to creating your first action box. 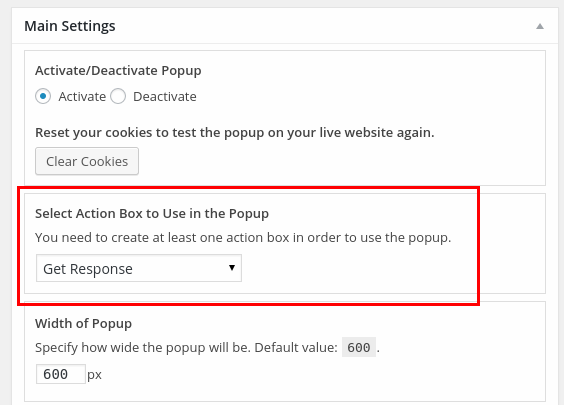 Log in to your WordPress Admin Dashboard and go to Magic Action Popup → Create Popup. Fill in the name of your popup. Next, select the action box that you would like to use for this popup. You may use the action box you created in the previous step. You may leave the other settings at their default values. Width of Popup – specify how wide the popup will be in px units. If you leave this blank, the popup will try to fill the entire screen. If the screen is smaller than the specified width i.e. mobile, the popup will adjust automatically. Look for the Activate/Deactivate setting and choose Activate. Next, we need to specify where we want our popup to show up. Go to Magic Action Popup →Popup Settings. You should see a number of tabs – Default, Front Page, Blog Page etc.. By default, they are not set to show popups. To show the popup everywhere, go to Default tab, and choose the popup you created. Next, go to the other tabs i.e. Front page, Blog page.. and from the drop-down choose Use Default. This option will pick up whatever setting you set up under the Default tab. You may of course specify a different popup for the different sections of your website. You may also choose to show specific popups on specific pages. This could be useful for landing pages. Number of days to wait before showing any popups again – a good practice would be to set this to 30 days so that everyday visitors don’t get annoyed with the popups everytime they visit your web site. Number of visit counts before showing any popups – you may choose not to show popups right away to first time visitors. If you want to show the popup only during their second visit to your website, then you set this setting to 2. Do not show popup if device screen size is smaller than – this setting is used to disable popups for mobile devices. This is useful if the action box you are showing in the popup is too big and is not responsive. Debug – shows some debugging information in the front end when enabled. Only turn this on at the developer’s request. Awesome plugin. i really love it. going to use it on mine. thanks for sharing this guide.